CAPTAIN Karen Guthrie produced an outstanding performance at Croke Park on Saturday night to give Donegal an opening round triumph over defending champions Dublin in Division One of the Lidl National Football League. The Glenfin ace (who finished with 1-4) was a deserved recipient of the Player of the Match award, as the Sky Blues fell to a first competitive defeat since March of last year - when Galway got the better of them in the group stages of the League. Starting with eight of the team that secured a second successive All-Ireland title last September, Mick Bohan’s holders opened the scoring through a Niamh McEvoy point. However, after she capitalised on a superb Niamh Hegarty delivery, Guthrie, in her 14h inter-county season, fired past Dublin’s skipper on the night, Ciara Trant, for a fifth-minute goal. While 2018 TG4 All-Ireland Final Player of the Match Carla Rowe ensured Dublin made an immediate response to this set-back, Guthrie and the ever-threatening Geraldine McLaughlin ensured Maxi Curran's visitors remained in the driving seat. Half-back Aoife Kane and Siobhan Killeen were subsequently on target for the Sky Blues - reducing the deficit to a single point on the first-quarter mark. Despite Rowe slotting over her second point on 19 minutes, the Donegal challenge gathered further pace in the closing moments of the half. McLaughlin converted a close-range free and Guthrie added a brace to give the O’Donnell County a 1-5 to 0-5 interval advantage. 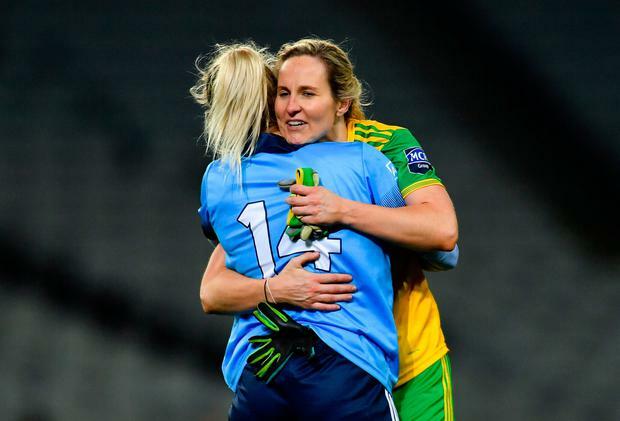 Nicole Owens registered a two-point salvo on the resumption to get Dublin back into the reckoning, but a determined Donegal subsequently built up a head of steam. McLaughlin significantly bolstered her tally with three unanswered scores and corner-forward Ciara Grant also found the range to give the TG4 Ulster champions a six-point cushion. The introduction of 2018 Footballer of the Year nominee Lyndsey Davey on 42 minutes was the spark that Dublin needed. Following a neat combination with Rowe, she fired beyond the reach of Aislin Nee with her first touch of the contest. A final-quarter fightback Dublin didn’t materialise from Dublin, though, as a disciplined Donegal held firm in defence. Given the way she had performed throughout, it was fitting that Guthrie rounded off a memorable Donegal victory with a supremely-executed point in stoppage-time. Scorers - Donegal: K Guthrie 1-4, G McLaughlin 0-6 (5f), C Grant 0-1. Dublin: L Davey 1-0, N Owens (1f), C Rowe 0-2, A Kane, N McEvoy, S Killeen 0-1 each. Donegal - A Nee; T Hegarty, E Gallagher, E McGinley; T Doherty, N McLaughlin, N Carr; K Herron, N Boyle; M Ryan, N Hegarty, A Boyle Carr; G McLaughlin, K Guthrie, C Grant. Subs: N Gordon for McGinley (46), S McGroddy for Boyle Carr (56), R Friel for Grant (60). Dublin - C Trant; M Byrne, N Collins, E McDonagh; A Kane, O Carey, S Fagan; J Dunne, N McEvoy; K Sullivan, S McGrath, S Woods; S Killeen, N Owens, C Rowe. Subs: C McGuigan for McEvoy (19), R Ruddy for McDonagh, L Magee for Fagan (both h-t), L Davey for Killeen (42), N Hetherton for Dunne (47), L Carolan for Sullivan (50), K Fitzgibbon for Kane (51), O Nolan for McGuigan (55), L Collins for Woods (58), E Rutledge for Owens (64). Ref - N McCormack (Laois). GALWAY got their Lidl NFL Division 1 campaign off to a winning start as four points from captain Tracey Leonard points helped them to get the better of Cork in Mallow. The visitors were deserving winners as they played the far better football over the hour and showed they are going to be a force to reckoned with this season. It was evident early on that this was the first outing for both as they gave the ball away easily and took some time to settle into the game. Defences were very much to the fore, with both sides finding it hard to create scoring chances. Galway were first off the mark, four minutes in, when Roisin Leonard set up Tracey Leonard for the opening point. Two minutes later Cork, the TG4 All-Ireland runners-up in 2018, were back on level terms when Aine O'Sullivan pointed. But straight from the restart Galway worked the ball down the pitch to retake the lead, through Riona Ni Flahartha. In a low scoring start it took Cork 18 minutes to level, this time Orla Finn pointed after a good exchange of passes with Eimear Scally. But the game exploded into life in the last seven minutes before half-time with first Mairead Seoighe finding herself in the sin-bin. But this didn't bother her side as they were back in front a minute later, when Tracey Leonard split the posts, and she doubled their advantage, to make it 0-4 to 0-2, with 25 minutes gone. With 27 minutes played Cork found themselves down to 14 when Aine T O'Sullivan followed Seoighe into the sin-bin. But just before half-time Galway took a grip on the game, when a great ball from Megan Glynn set up Roisin Leonard for the game's opening goal, to see her side lead 1-4 to 0-2 at half-time. Finn got the first score of the second-half for Cork, with three minutes gone and they weren't to score again until the game was in injury time. Seoighe increased Galway's lead, with 36 minutes played and she was on target again three minutes later, and this was to be the last score for the next 15 minutes. Both sides, particularly Cork, were guilty of missing chances, before Tracey Leonard extended Galway's lead and in the 29th minute Louise Ward made it 1-8 to 0-3. Cork got two points in injury-time, both from O'Sullivan, with one coming back off the bar as she went for goal and she put the breaking ball over, as Galway ran out deserving winners. Scorers – Galway: T Leonard 0-4 (1f), R Leonard 1-0, M Seoighe 0-2, R Ni Flahartha, L Ward 0-1 each. Cork: A T O'Sullivan 0-3, O Finn 0-2 (1f). GALWAY: D Gower; M Coyne, S Lynch, F Cooney; S Molloy, L Ward, C Cooney; O Divilly, M Glynn; M Seoighe, T Leonard, L Coen; R Ni Flahartha, R Leonard, S Conneally. Subs: L Hannon for M Glynn (33), A Thompson for S Conneally (43), B Murphy for R Ni Flahartha (55), B Hannon for R Leonard (56), L Booth for M Coyne. CORK: M O'Brien; S Kelly, H Looney, A Hutchings; M Cahalane, M Duggan, D Kiely; C McCarthy, A T O'Sullivan; E Kiely, N Cotter, L O'Mahony; L Coppinger, E Scally, O Finn. Subs: S O'Leary for C McCarthy (h-t), A Kelleher for M Cahalane (h-t), C Collins for S Kelly (40), M Ambrose for D Kiely (50m). Daragh Small Cork manager Ephie Fitzgerald believes his young side have the potential to return to past glories, as they clung on for an inspirational victory over champions Dublin. Independent.ie Sportsdesk Galway manager Tim Rabbitte wants to see his side hit new heights against Cork in the Lidl NFL Division 1 final after they eased past Donegal in the last four. Daragh Small The inside joke in Raheen every Sunday evening is: "We might see you Friday, Niamh."